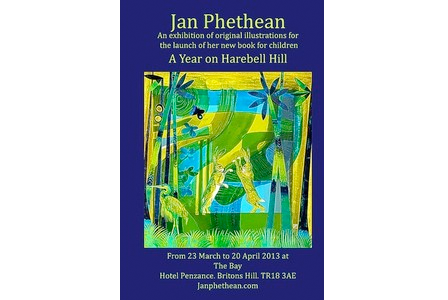 A YEAR On Harebell Hill is a new book for children by Cornish artist Jan Phethean. It is lavishly illustrated and features a monthly scene per page reflecting the landscape in Cornwall and the wildlife that lives there. Hares (which no longer exist in Cornwall sadly) feature on almost every page, often in comical encounters with other wild animals. A helpful rhyme encourages children to remember the names of the months and their order, as well as presenting opportunities to learn about our wildlife, Cornish landscape and the changing seasons. Phethean is a contemporary painter of landscape and a member of the newly formed Back Road Artworks group in St Ives. Her paintings reflect her love of landscape and the myriad wildlife she sees daily from her studio situated in fields on the cliffs of Rinsey Head, near Helston. The original illustrations are based on a screen-printed landscape which she then glazed and scored. Small pen and ink animals and painted vegetation are cut out by hand and collaged to create a three-dimensional image. In addition every letter of the poem has been cut by hand using a tiny pair of nail scissors, which has been a labour of love, Phethean admits. The book is the culmination of almost three years’ work and is a beautiful educational tool to read with parents or teachers alike. It will appeal to young and old alike. Twelve original illustrations are on display. These are not for sale, however there are original artworks, prints, cards and books available to buy.